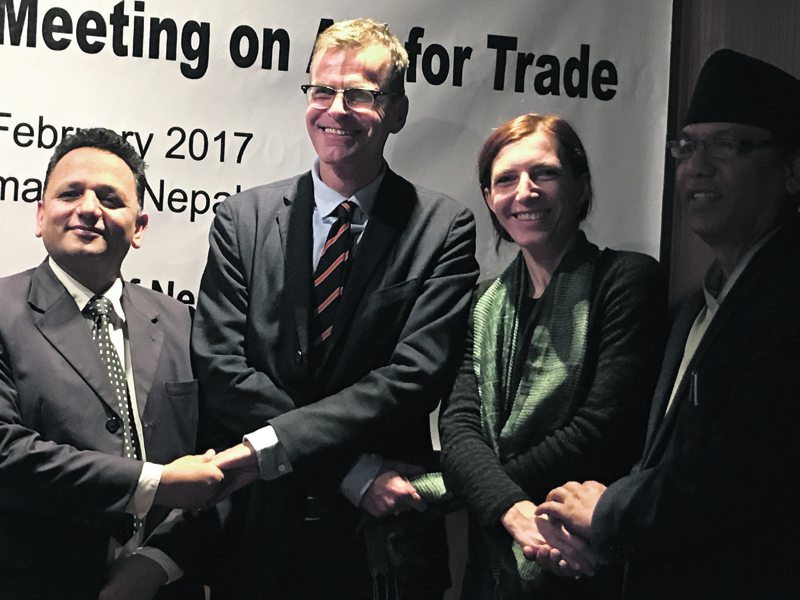 Commerce Secretary Naindra Prasad Upadhyaya (right), Deputy Chief of Mission of German Embassy Jacqueline Groth (2nd from right) and Head of Cooperation of EU Delegation to Nepal Andreas Roettger (2nd from left) at the 16th Donor Group Meeting for Aid for Trade program in Kathmandu on Monday. KATHMANDU, Mar 7: Nepal has requested development partners to prioritize their support in four key areas -- product development, trade-related infrastructure development, trade facilitation and market promotion for the trade-led sustainable and inclusive economic growth, and gender empowerment and poverty reduction. Addressing a concluding ceremony of 16th Donor Group meeting on Aid for Trade (AfT) on Monday, Commerce Secretary Naindra Prasad Upadhayay said that the government has prioritized trade as an important component to achieve inclusive and sustainable economic growth, gender empowerment and poverty reduction through various periodic plans, policies and strategies. Thanking Germany for its vital role as Donor Facilitator for the last five years, Upadhayay welcomed the EU Delegation to Nepal as the EIF Donor Facilitator. He further stressed that the Ministry of Commerce was looking forward to jointly work with the European Union (EU) and relevant stakeholders, including the private sector, for address the challenges in trade sector due to limited supply capacity and inadequate trade-related infrastructure. The meeting reviewed the implementation of the Action Matrix of Nepal Trade Integration Strategy (NTIS) 2016; the Capacity Development Strategy (CDS) of Ministry of Commerce; and the formal handing over the role of Enhanced Integrated Framework (EIF) Nepal Donor Facilitator from the Embassy of Germany to the European Union (EU) Delegation to Nepal. During the meeting, various development partners working in trade sector in Nepal expressed their firm commitments in supporting implementation of NTIS 2016 and for the overall trade sector development of Nepal. Speaking on the occasion, the out-going EIF Nepal Donor Facilitator and Deputy Chief of Mission of German Embassy in Kathmandu, Jacqueline Groth, appreciated the efforts being taken by the government on the policy front by bringing out the Trade Policy, NTIS 2016 and CDS. She also highlighted the need for support from Nepal's development partners to the government for the implementation of trade policies and strategies. She also underscored the importance of coordination among various line ministries and the private sector for mainstreaming trade in sectoral polices, plans and leveraging resources. Similarly, the new EIF Nepal Donor Facilitator and Head of Cooperation of the EU Delegation to Nepal, Andreas Roettger, expressed the pleasure of the delegation in assuming the new role. He said that the EU was one of the largest trading partners in the world and the EU sees trade and investment also as very important vehicles for inclusive development as outlined in its 'Trade for All' strategy. Least Developed Countries (LDCs) like Nepal benefit from the most preferential trade regime globally available, and Nepal has the potential to embrace this opportunity stronger. In 2016, Nepal exported goods worth 90 million euros to the EU, making it Nepal's second largest export market after India. The EU's 'Everything But Arms' initiative allows duty and quota free access for all kind of products with the exception of weapons and ammunition. The government's Trade Policy 2015 has prioritized supply-side capacity building, increase in production and productivity, trade in services, protection and promotion of intellectual property rights, trade mainstreaming, aid for trade, and corporate social responsibility as mechanism to boost trade in the country. 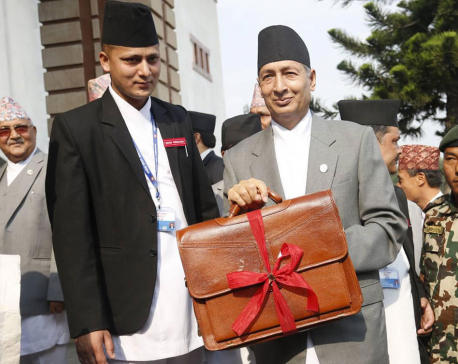 In close complementarily with the policy, the government has launched Nepal Trade Integration Strategy 2016 which seeks to address the outstanding trade and competitiveness challenges confronted by the country's export sector. NTIS 2016 focuses on actions to address constraints on the seven broadly grouped cross-cutting sectors and 12 priority export potential sectors by 2020. It includes nine products -- cardamom, ginger, tea, medicinal and aromatic plants, fabrics and textiles, leather, footwear, Chyangara Pashmina and Knotted Carpets - and three services -- IT and Business Process Outsourcing, Tourism, and Skilled and Semi-Skilled Professional Services. The NTIS 2016 has identified 190 actions to be implemented by 2020 with clear roles and responsibilities along with quantitative indicators to measure its success. 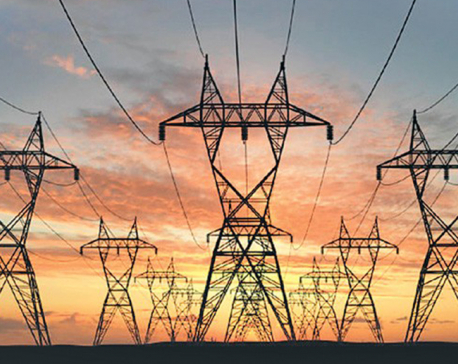 It has clearly outlined its focus on supply capacity through increased production and productivity; product and value chain development; development of trade-related infrastructure to address the bottlenecks of supply-side constraints and enhanced market access in terms of both technical and institutional capacity building.